This photo of a wary rabbit struck me this morning. As I adjust to living in an apartment, I feel kind of like a rabbit. Not brave. Watchful, wary, and alert all. the. time. It’s exhausting. 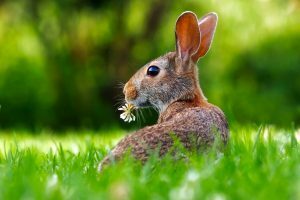 How do rabbits survive without dying of exhaustion or fear? My little dog, Dottie, is feeling the same way, I think. There are other dogs who live in this building. Some of them are like my Dottie; quiet and cautiously curious. Others are scary. They lunge, bark menacingly, or snarl at us. This makes venturing out of our apartment a little nerve-wracking. When you have a dog with a tiny bladder, we go outside a LOT! Every outing feels like Russian Roulette. Will we get in and out without an unpleasant or scary encounter? Will we bump into that large German Shepard lunging out of the elevator? Will my across-the-hall neighbor open her door at the same time as me, with her I-don’t-like-other-dogs-unfriendly pooch? While walking in the neighborhood, will those two loose, defensive dogs chase us down or bite us? So, this leads me to think what a scaredy cat I am. Which reminds me that God wants me to be brave, not fearful. 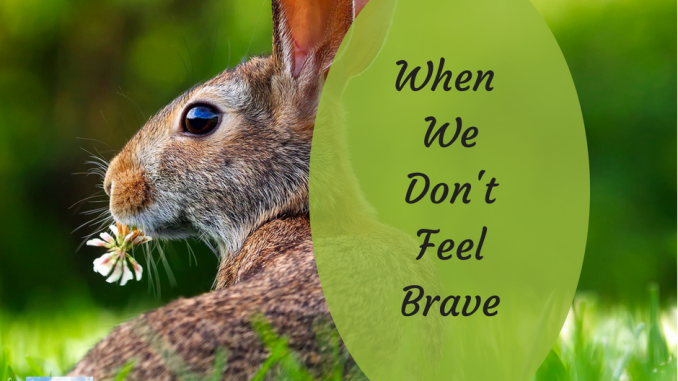 In many places in the Bible, we are encouraged to be brave. I’m not a naturally brave person. I feel more like a timid rabbit, who survives by hiding. But today, I will meditate on these words: God will be with me wherever I go. As I remind myself that I am not alone, God will help me be brave. What Helps You Be Brave? Finally, what about you? Do you need some bravery in your life? What or who inspires you to be brave? Great post Kathy, and this song is one of my favorites! I’m sure you’ll get used to navigating the new challenges and before long, you won’t even have to think about it. In the meantime, it’s wonderful that you remember God is with you as you go about your day. Thanks so much for reading and commenting, Terri.